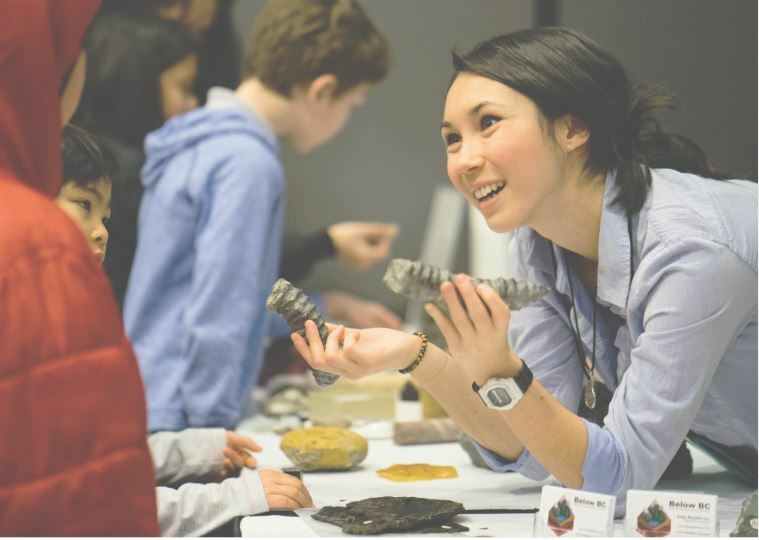 I communicate science primarily through science outreach programs, where I can share my passion of earth sciences and inspire young minds. However, it can also be done through other mediums like lectures, museums, television shows, podcasts, books, and blogging. Science communication is an important aspect of any scientists’ job, as it aims to influence policy, share scientific advancements, recruit the next generation of scientists, improve science literacy, influence attitudes towards science, and empower citizens. It’s important for scientist and geologists to communicate their own work because they have the best understanding of their subject, and therefore they can best represent the information fairly. Whether you’re working with government, fellow scientists or the public, effective science communication skills are an asset. Even if a scientist lacks such skill, science communication can be learned and practiced. The new Science 301 course at SFU is a perfect example. This course, designed for upper division undergraduates and graduate students and taught by an Earth Sciences professor, teaches fundamentals and tools for effective communicating science. From my experience, the main ingredient for science communication is passion. And passion is something that I know most geologists have. How else are we supposed to get excited about inanimate objects like rocks? You don’t have to be at a conference or speaker event to communicate science either. Science communication can happen anywhere, even at your own dinner table. In today’s world, it is important for geologists to participate in science communication initiatives to work with government, scientists, and the public to improve science literacy, empower individuals to be well informed, influence policy, and recruit the next generation of geologists. Failure to do so can impede projects and, in an extreme case, cause geology programs to fold. We all have a role to play. Use your knowledge and passion of geology and current events to start a conversation with family and friends around you, thus communicating science. As for myself, I’m discovering my role in communication the geoscience brand through science outreach and journalism.